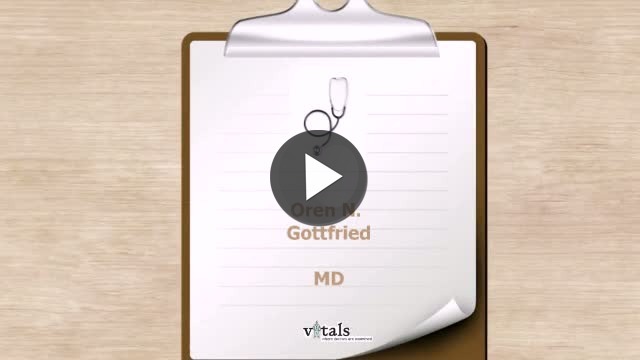 Dr. Oren N Gottfried, MD is a Doctor primarily located in Raleigh, NC. He has 18 years of experience. His specialties include Neurological Surgery. He speaks English. Dr. Gottfried has received 8 awards. The overall average patient rating of Dr. Oren N Gottfried is Excellent. Dr. Oren N Gottfried has been rated by 48 patients. From those 48 patients 19 of those left a comment along with their rating. The overall rating for Dr. Oren N Gottfried is 4.6 of 5.0 stars. Dr. Gottfried was a Godsend! Having had two previous failed back surgeries with other surgeons, I was hesitant about attempting a third but it was getting increasingly difficult to walk at times and my quality of life was going downhill fast. I decided to turn to Duke in Raleigh and found Dr. Gottfried who had experience with patients like me. He listened attentively and then explained my options clearly. He patiently answered all my questions as well as those my family asked. Noting my apprehension, He didn’t pressure me but instead said I could think everything over and if I decided to have the surgery I just had to call. The day of the surgery I again met with Dr. Gottfried who kindly reassured me that he would do his best to help me. Everything went smoothly with no complications. Well it’s been 2 1/2 months since my fusion and I am SOOO much better! During those initial days after discharge I had questions which I was able to direct to Dr. Gottfried and his staff thru the patient portal and I always got prompt answers and solutions. I am also very grateful to the compassionate and professional staff at Duke Hospital in Raleigh who provided me with excellent care. Upon discharge I received equipment to help me at home including a back brace (never got that before!) I have been truly blessed! Dr Gottfried has been my neurosurgeon since 2012 and has performed 2 fusions on my lower spine. My first surgery in that area was done by another surgeon in 1995 and left my lower spine unstable and limited what I could do physically. I still have some common sense limitations but thanks to his knowledge and skill I am able to enjoy a much more physically active and healthier lifestyle. Also he does not rush into performing surgery but offers treatment options to try to avoid surgery. I recommend him to everyone who tells me they are experiencing back pain. The absolute best in his field. He has been my "spine" Doctor since 2012 I am now 75 yrs old and thanks to his knowledge and skills as a surgeon I am able to be more physically active with minimal pain than has been possible since my first lower back surgery 20+ years ago by another surgeon. He does not rush to perform surgery and suggests alternative treatments that some patients can benefit from. I recommend him very highly and would give him 10 stars if that were an option. after a traumatic accident, my son was left with a 18mm brain bleed, contusions, and skull fracture. He lost the ability to speak. Dr Gottfried was helpful and honest every step of the way. He gave every test possible and weighed the need for surgery minute to minute. We felt like we were in the best possible hands while in the Duke Neuro ICU. Gottfried is the reason my son can talk and is back at work fulltime with no evidence that he was ever hurt. We owe Gottfried everything for how he helped our family. We thank GOD for him and the miracle he gave to us. I would recommend Gottfried to all of my closest loved ones. Take a minute to learn about Dr. Oren N Gottfried, MD - Neurological Surgery in Raleigh, NC, in this video. Dr. Oren N Gottfried is similar to the following 4 Doctors near Raleigh, NC. Have you had a recent visit with Dr. Oren N Gottfried? Select a star to let us know how it was.